When watching sci-films it’s interesting to see how writers and directors imagine our world to be in 20, 50 or 100 years from now. These films often drive technological advancement by sowing the seed in the minds of the young inventors of the future. What about our working lives in the next 20 years? Thanks to work done by The Oxford University, looking at the probability of computerisation for 702 occupations in the US labour market, we no longer have to rely on the vision of film directors. 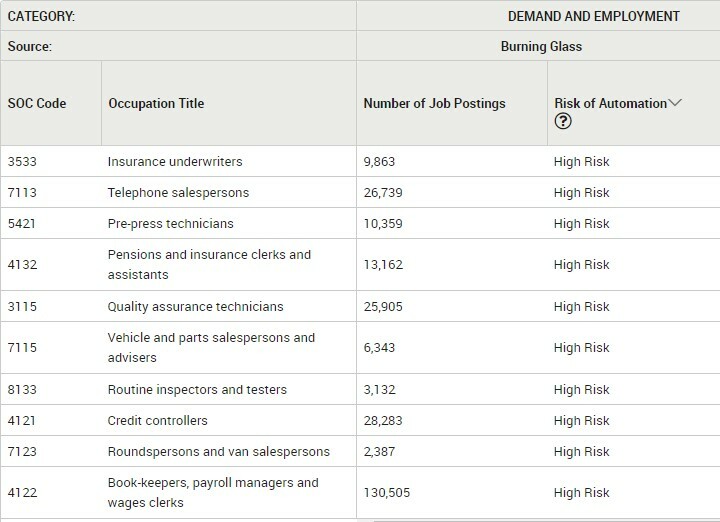 The job listings tool Labour Insight now incorporates this data and indicates a risk score of high, medium or low against occupations. A high score indicates that large parts of the current skill set of this occupation have a high risk of automation in the next 20 years. 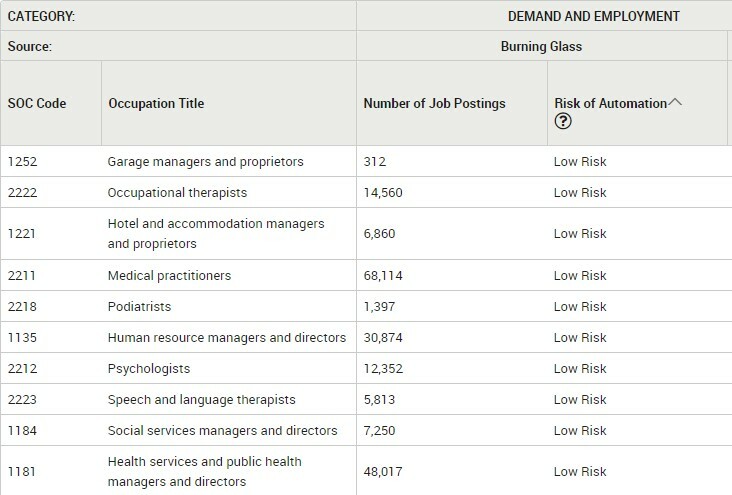 The table below shows top at-risk occupations listed on job sites in the UK over the last 12 months. Jobs that are in demand now but may not necessarily be so in the not too distant future. We can broadly say that those most at risk are occupations relying on manual data processing. For example, accountancy as a required skill was listed in almost 63,000 job ads for both book keepers, payroll managers and credit controllers – all feature in the most at-risk list. Highest risk of automation job postings in the UK – looking at all job postings for past 12 months to 29th Jan 2018. Results by 4-digit SOC code. Conversely, those occupations at least risk of automation are those requiring specialist skills, working with and looking after people. Naturally medical and health service practitioners are amongst those least at risk of being replaced by technology. Lowest risk of automation job postings in the UK – looking at all job postings for past 12 months to 29th Jan 2018. Results by 4-digit SOC code. The time to retrain is now! In the hands of careers advisors, LEPs and local authorities, provision can be made for those in vulnerable jobs to reskill and move into roles with a better future. Using Labour Insight we can start mapping a transition path for the affected working population now. The most recent research from the World Economic Forum, looking at the US jobs market, suggests that 1.4m people will be displaced by new technology by 2026. However, it’s predicted that 96% of these will be re-employed in new, often better positions. We can pinpoint opportunities for reskilling using Labour Insight. 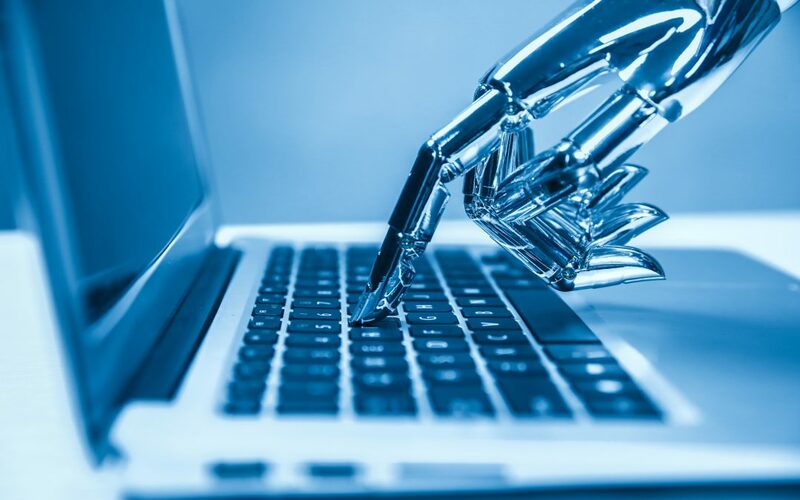 While accountants and book keepers appear high on the risk list, business analysts, are very much in demand and carry a low automation risk. Many business analyst job postings require qualified accountants so this would be a natural transition.